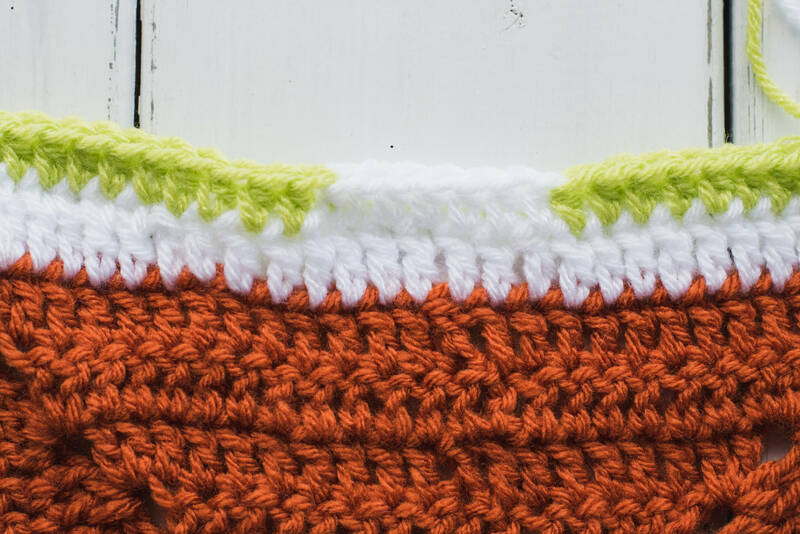 CSDC – Chainless Standing Double Crochet (used as a substitute for a ch-3): Pull up lp on hook to height of a standard double crochet, securing lp on hook with finger, twist lp around hook as for a yo, insert hook in indicated st, yo, pull up a loop, yo, pull through 2 lps, yo, pull through 2 lps (see video CAL for demonstration). 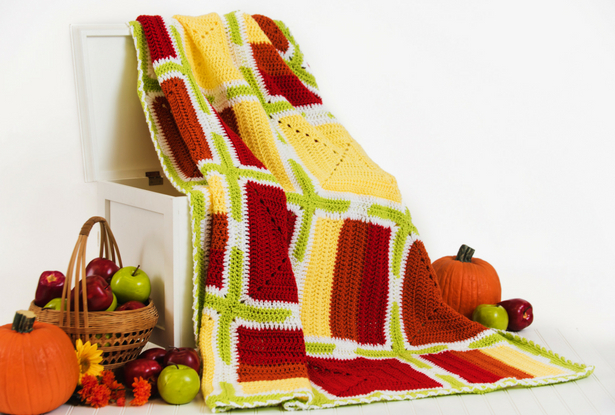 This pattern as written creates a throw sized blanket using twenty 12” squares. 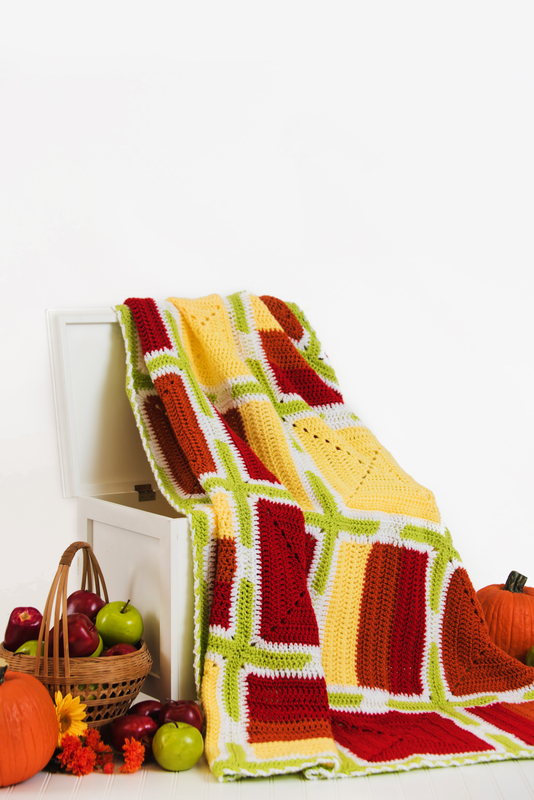 For a bigger or smaller blanket, adjust the number of squares used. 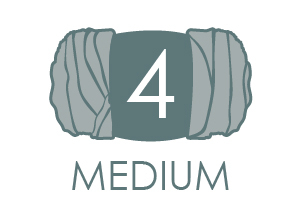 Block #1 uses “turned rounds” or “joined rows”. Though you are working in the round, turn when indicated to work in the opposite direction, from the Wrong Side (WS) of the block. Rnd 1: CSDC in the ring, 2 dc, (ch 2, 3 dc) 3 times, ch 2, join to CSDC with sl st, turn – 12 dc. Rnd 2: (CSDC, dc, ch 2, 2 dc) in ch-2 sp, dc in next 3 sts, *(2 dc, ch 2, 2 dc) in next ch-2 sp, dc in next 3 sts; rep from * around, join, turn – 28 dc. Rnd 3: CSDC in first st, *dc in each st to ch-2 sp, (2 dc, ch 2, 2 dc) in next ch-2 sp; rep from * around, join and turn – 44 dc. Rnds 4-6: Rep Rnd 3 – 96 dc. Rnd 7: Rep Rnd 3, break yarn, do not turn – 108 dc. 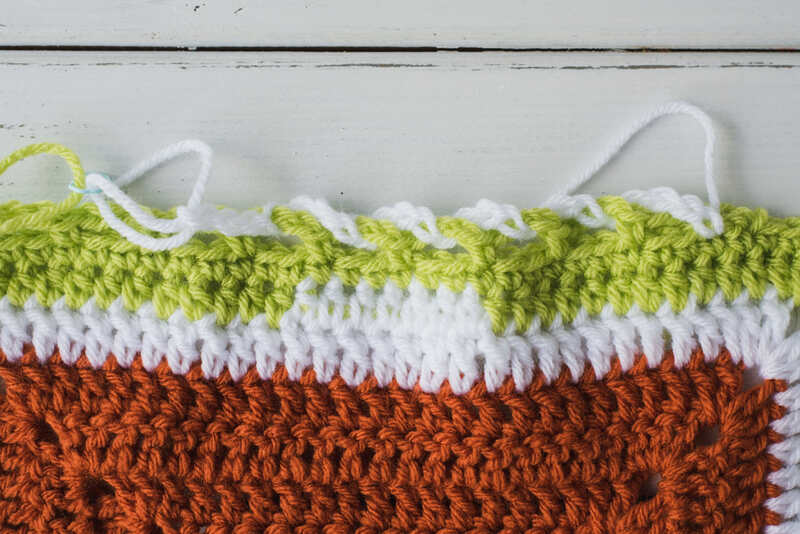 Rnd 8: With Color D, join to any st with dc, rep Rnd 3, break yarn, do not turn – 124 dc. Rnd 9: With Color E, join to any ch-2 sp, ch 1, 5 hdc in same ch-2 sp, *hdc in next 12 sts, switch to Color D, hdc in next 7 sts, switch to Color E, hdc in next 12 sts**, 5 hdc in next ch-2 sp; rep from * around, finishing last rep at **, join, break yarn – 144 hdc. 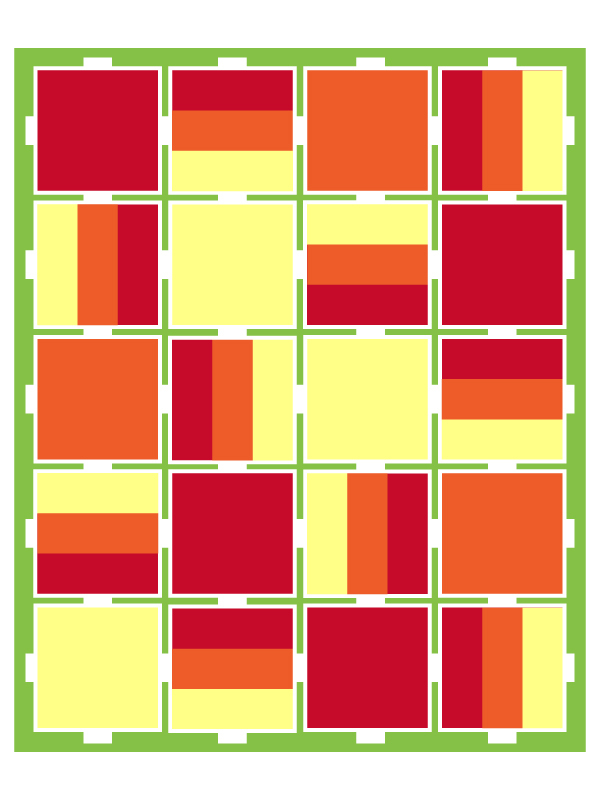 Row 1: With Color C, ch 31, sk 2 chs (does not count as a st), dc in each ch across, turn – 29 dc. Note: If preferred, FDC 29 for Row 1. Rows 2-4: CSDC in first st, dc in each st across, turn – 29 dc. 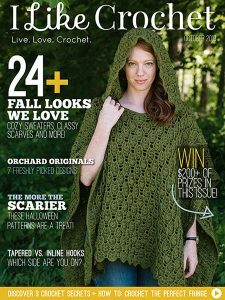 Row 5: Ch 1, hdc in each st across, break yarn, turn – 29 hdc. Row 6: With Color B, join to first st with dc, dc in each st across, turn – 29 dc. Rows 7-10: Rep Rows 2-5. Rows 11-15: With Color A, rep Rows 6-10. Rnd 16: With Color D, join to first st with dc, (dc, ch 2, 2 dc) same st, dc in next 27 sts, (2 dc, ch 2, 2 dc) in next st, *dc 27 sts evenly along side of block (work 2 dc in the side of each dc row and work 1 dc in the side of each hdc row),** (2 dc, ch 2, dc) in unused lps of first foundation ch, dc in next 27 foundation chs, (2 dc, ch 2, 2 dc) in last foundation ch; rep from * to **, join, break yarn – 124 dc. Rnd 17: Rep Rnd 9 of Block #1. 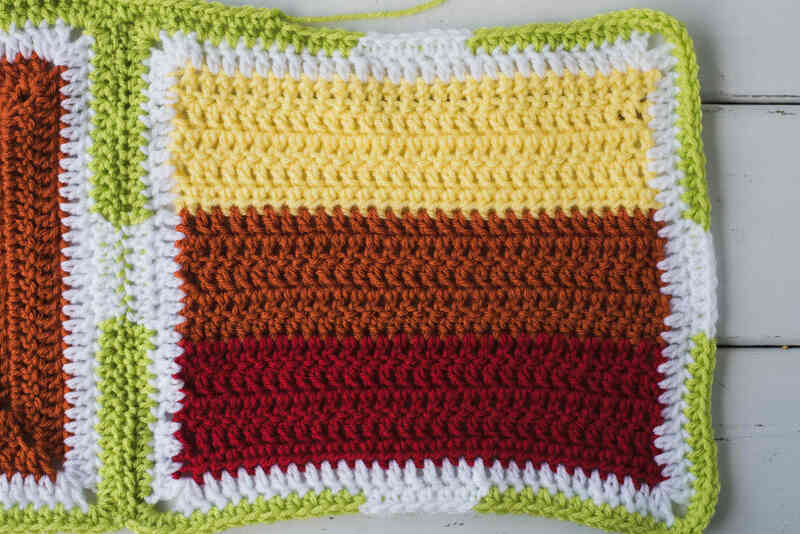 Use the mattress stitch and Color E, sew squares together in layout shown. 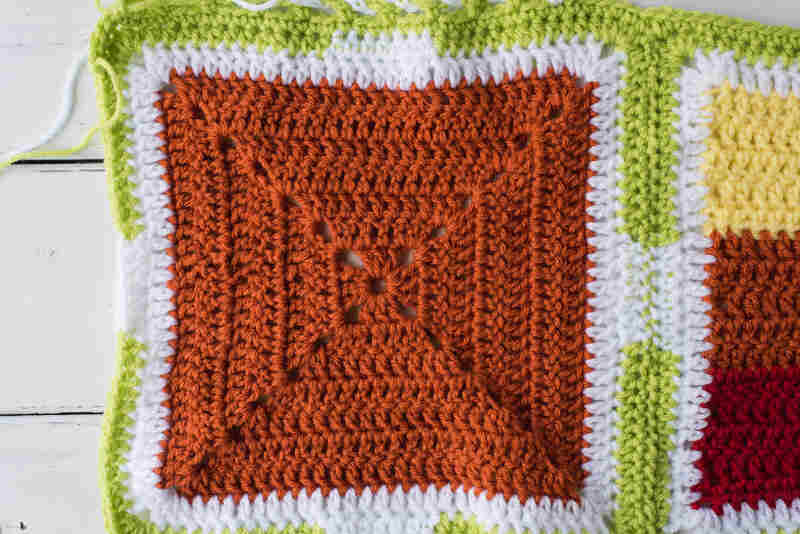 Rnd 1: With Color E, sc evenly around blanket, working 3 sc in each blanket corner st and hdc sts in the joined/sewn corner sts of the squares, join. Rnd 2: Ch 1, sc in each st around, working 3 sc in each corner st, join. Rnd 3: Ch 1, sc in the first st, ch 3, sk next 3 sts, *sc in next st, ch 3, sk next 2 sts; rep from * around, join, break yarn. Rnd 4: With Color D, sl st into first skipped st of Rnd 3, *ch 4, remove loop from hook, insert hook under next ch-3 loop of Color E, replace loop on hook; rep from * around, join, break yarn.